Determinants of supply, what shifts a supply curve? - FreeEconHelp.com, Learning Economics... Solved! 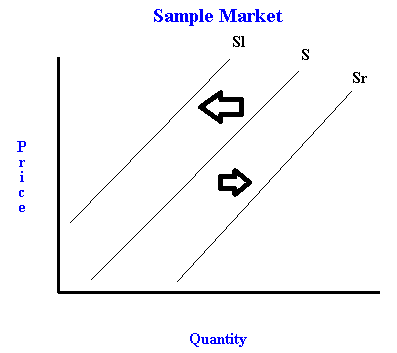 Home econ help law of supply microeconomics Determinants of supply, what shifts a supply curve? Input prices: The price of inputs has a negative effect on the supply curve, if the price of inputs goes up, supply will decrease (shift left). Imagine you are running a taco shop, and the price of corn goes up. Since it now costs more to supply tacos, you are going to have to charge more for your tacos, or shift your supply curve left (Sl). Workers organizing a union would also count as an increase to input prices (assuming the union negotiated higher wages). Similarly, if the price of corn goes down, you can now afford to supply the same amount of tacos at a cheaper price which results in an increase in supply (Sr). Productivity: Productivity basically means the cost of the process to produce the goods. For example, if a new form of technology means you can produce things more cheaply, supply will increase (Sr). This happened when Ford designed the assembly line, it became cheaper to mass produce items so supply increased. A counter example is regulation, if the government wants to make the workplace safer but slowing down production, this would cause a decrease in supply (Sl). Another example would be a blight or natural disaster to a farm. Destroying the crops available would definitely hurt productivity, and thus shift the supply curve left (Sl). The price of a substitute in production: This one is tricky, but imagine that you can make both tacos and fuel with corn. If you are a taco producer, then fuel is a substitute in production. If the price of fuel goes up, then you are more likely to produce fuel than tacos, so a decrease in the supply of tacos would occur (Sl). But if fuel suddently becomes cheaper, it is now better to produce tacos, so we will see an increase in the supply of tacos (Sr). Number of firms in the market: This determinant leads us to the conclusion that competition is better for the market. As we see more and more firms enter the market, more and more of the good in question gets produced. So an increase in the number of firms gives us an increase in supply (Sr), while a decrease in the number of firms gives us a decrease in supply (Sl). The expected future price of the product: This has to deal with hoarding behavior. If everyone expects the price of gold to be higher in the future, they will sell less of it now to take advantage of higher future prices. This causes a decrease in supply (Sl). However, if people expect the price of houses to drop in the future, then everyone will want to sell today, which will result in an increase in supply (Sr).